Industrial pure aluminum coil stock, also called 1xxx coil stock, refers to aluminum coil in which the content of aluminum reaches 99% or above. Different number types stands for different content of aluminum in the coil. For example, 1050 means there is 99.5% aluminum element in the coil, and 1060 99.6% aluminum in the coil. The commonly used types are 1050, 1060, 1070, 1100 and 1200. Industrial pure aluminum coil stock has many advantages. First, it boasts small density. The density of pure aluminum reaches as low as 2700kg/m3, only 35% of that of iron. This makes it one of the lightest metal material for various industries. Products like planes and vehicles are usually required to be as light as possible to reduce power consumption. Coupled with its lower price, the stock become popular substitute of copper and iron in many industries. Second, it can be strengthened. Its hardness can be coupled through cold working, and can compete with steel alloys if it’s combined with other elements like manganese, magnesium, copper, zinc etc and further heat-treated. Third, it’s easy to be processed. Aluminum coil stock is suited to be cast by any method like rolling, pressing, drawing etc. Fourth, industrial pure aluminum coil stock is corrosion resistant. 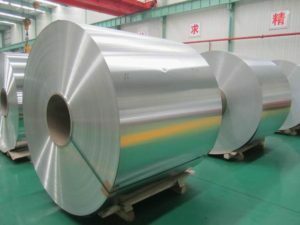 A solid dense layer of protective film is always produced on the surface of aluminum coil stock, because aluminum has chemical reaction with oxygen easily. This protective film can not be destroyed unless they meet strong halide ions or basic ions. That’s why aluminum coil stock can firmly resist corrosion of industrial air, sea air, water, most acid materials and organics. Fifth, it does not become brittle at low temperature. Its hardness even become stronger below a temperature of 0o. Sixth, its heat and electricity conductivity ranks the fourth of all metals. The first three is silver, copper and gold. Seventh,it shows strong reflection of lights. The reflection rate for white light of its polished surface reaches 80% and above. Besides, it also performs good reflection property for infrared ray, UV, electromagnetic wave and heat radiation. The pure the coil stock, the higher the rate is. Eighth, industrial pure aluminum coil stock has no magnetism and withstands nuclear radiation. In spite of its wide application, industrial pure aluminum coil stock still has its advantages. The most influential one is that its hardness is not so satisfied as other types of aluminum alloys, which decides it can only be used in products requiring little about hardness.